FRENCH RIOTS GET RESULTS! 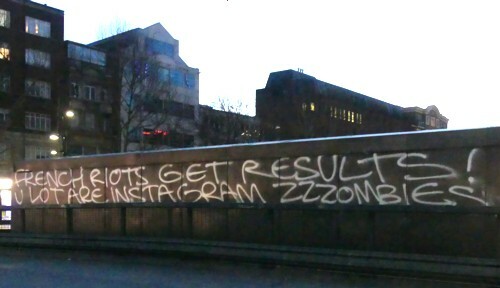 U LOT ARE INSTAGRAM ZZZOMBIES. The above transcript has the added advantage that if anyone sees this same proclamation and types the words of it into the www, there’s a good chance they’ll get sent here. This message is (or perhaps now: was) to be seen on the bridge where the top end of Tottenham Court Road goes north over Euston Road and turns itself into Hampstead Road. I’m not sure what to make of it. He (it probably is a he) has a point, I suppose, if by results you include the riot police getting a pay rise. Riots do sometimes get results, but only in rather particular circumstances, I think. Things like a very weak and unpopular government, and preferably also a dithery and indecisive one; and like: a symbolic issue of great potency, and like: the absence of any other means to express discontent. Personally, I prefer taking photos.